Under the man’s inquiring and sharp glance, The Aeolian Islands offer a dreamy scenery, the mighty rocks, rising from clear waters, working like mirrors for a nocturnal moon landscape so beautiful to inspire verses, words, and images of the most romantic poets; the charm of the pristine nature. This is the first breath-taking image which surprises a man in front of the greatest artists’ masterpiece of the world: the nature. Unique in their genre the Aeolians are the land of a beauty which goes back to an unmistakable wisdom of a population , who was capable to protect, without violent interventions, the nature’s presents; a population, which transformed the foreign dominations during the centuries, into the heritage of a culture, favourable to integration, and not to the withdraw of its identity. The genesis of this paradise, of this Mediterranean Eden is the strongest echo of that mythology dealing with human’s and divinities’ events, once appeared in the history and the traditions thanks to a background made of crystalline waters, of sulphite, and of white mountains , which reflect the sun’s light, the Apollo’s beauty. The magic universe, which welcomes those who chose the evasion from urban stressing life. The Aeolians, the pride of a culture made of sea and earth , the story of mare nostrum showing imposing rare beauties, being similar in genre ma so unique and different for its peculiar seductive beauty, which attracts visitors from all over the world. The earth of perfumes and good food, capable to satisfy the most exigent tastes, the earth which sweeps away the chaotic urban stress, and offers the full enjoyment of senses. 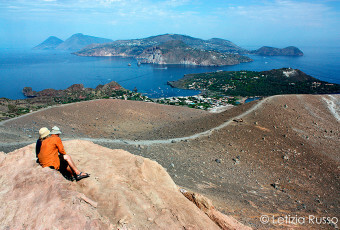 The amazing Aeolian Islands seduce visitors with their natural wealth, with their historical-cultural heritage, and with the mythological atmosphere you breath. The cradle of a culture which had various dominations during its history, from the Arabians to the Phoenicians, from the Greek to the Romans the Aeolian Islands are a natural and vivid evidence of a culture which did not submit to the dominators, but was able to combine old traditions and the new ones of the populations, who perhaps because of the great islands’ beauty, tried to be its conquerors and dominators. A liveable historical-archaeological find, which deals not only with past memories, but can be lived and changed by time, a perfect and harmonious mixture of faraway pasts, presents to enjoy, and futures to plan, in order to transform this destination into a fixed appointment for holidays, for travellers who love enjoying the presents of nature. The touristic holiday offer of the amazing Aeolians satisfies every exigency; the offer of the comfort holiday is different from the dynamic holiday, which includes a possibility of practising all the nautical sports, and not only; the extreme shiver that only wild nature can offer, and it leaves yourself satisfied, beyond every expectation, even a tourist fond of extreme sport. Surely the isles of Alicudi and Filicudi are suitable to who wants to feel tranquillity and relax; they are unique in genre, and are considered a perfect antidote against stress; the social life finds a maximum of its expression on Panarea island; it’s a VIP’s destination, and of who, fond of nature, cannot give up a luxury and nocturnal enjoyment. Families will not be disappointed once chosen Salina as destination, a charming island for its landscape; for who loves natural sceneries typical of documentary, and wants to enjoy the living shows, which only an active volcano can offer. 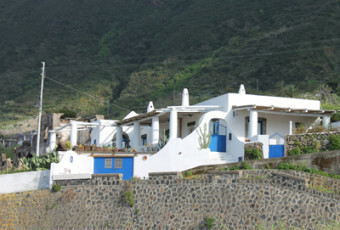 So you cannot avoid to visit, at least once in your life, the islands of Vulcano and Stromboli; for a tourist, who, on the contrary, wants to maintain a certain contact with the city, the perfect destination is Lipari, being between the islands the only one permitting to the tourist to feel himself “at home”, resting meanwhile immerged in a natural paradise. The images of these paradisiac landscapes fix the fragments of the sceneries similar to pictures depicted a gouache, the Aeolians are a synesthetic cross-reference which crossed perceptions and re-elaborations of travellers, scientists, artists and poets, great men of each time, cultured and adventurous who crossed the South of Italy to observe and to record history, culture and a nature rich of eruptions and volcanic landscapes. The Aeolians, a place of soul, catch with their natural strength whoever visits them. The volcanoes are the extreme symbol of the brightness and caducity of everything, the landscapes offered by the Aeolians, indistinctly, with their colours and shapes, tell their story. 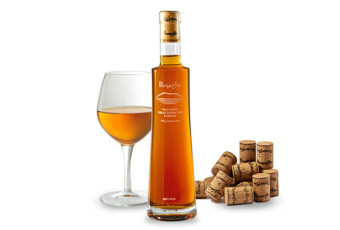 Their origins are strictly connected with fire and with the depth’s magmas, crystalline sea’s water imprinted to the myths, re-generates and alienates from the world, the perfumes and the tastes permit to re-discover the superfine taste of the essential. The Aeolian Islands: the earth spreading everywhere its breast to the visitors, as if it wanted them to fall in love with it, spreads its arms into the sea, and kindly accepts greetings, which never reveal to be adieus, and have all the taste of return. “Immerged into the charming Sicilian sea these small islands attracted my soul in an extraordinary mood, whether I was observing them between the mighty winds, like the winter tramontane, following which the Aeolians probably were called, or whether they appeared to me through one of the very waterspouts, which so frequently accompany spring showers, that is pampini of warm summers, similar to emeralds in cerulean sapphire of the sea. In this way I knew them, and they were equally dear to me, so once finished the Baleares description, I wanted to dedicate my work to Lipari. 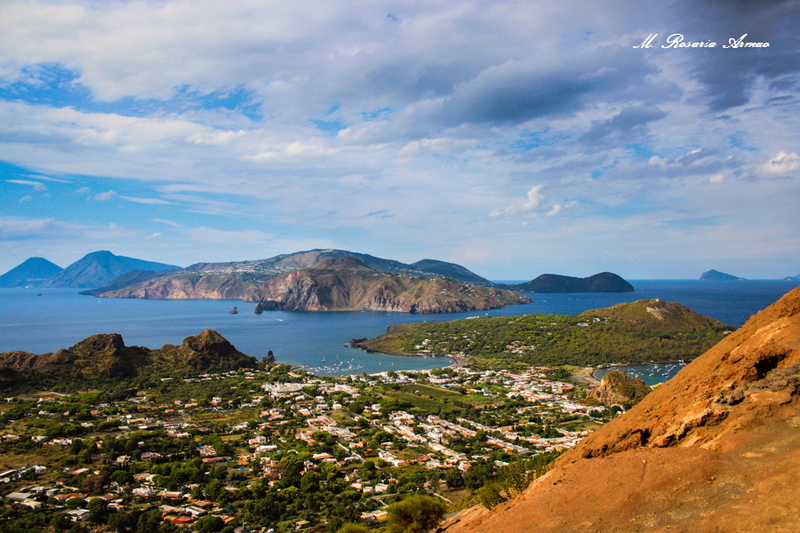 Panaria, even if the smallest, surely is the most pretty of the Lipari Islands, a really idyllic corner of the world. Everywhere you can admire the amazing panoramic views; throughout the small white houses with columns and pergolas, near to which a luxuriant fig or a carob tree, and from where you can admire the wide view upon the sea. 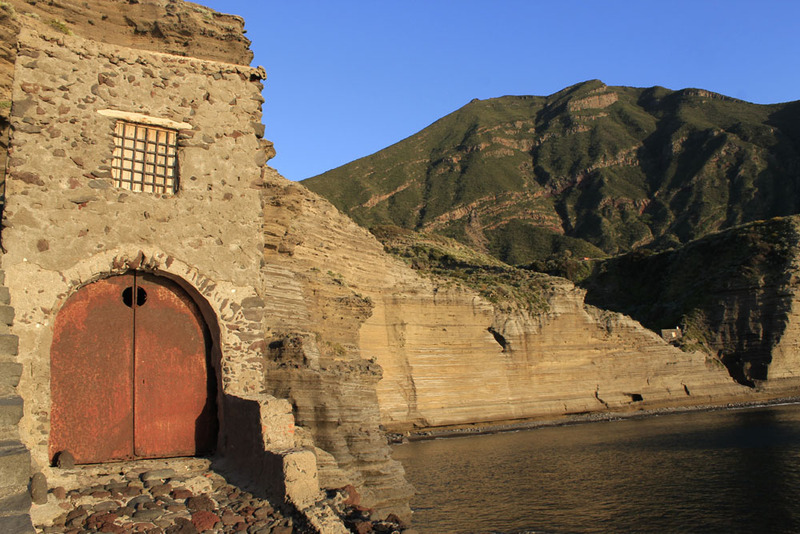 Particularly beautiful, behind the church, there is a group of Timpuni with its rocks, wild sorbs, olive trees, canna, an amazing view upon the sea, and the isles of Basiluzzu and Dattilu. On the south-western side of the island there is a small characteristic creek, the Puortu Drauttu, where the outstanding rocks create almost a half moon, and embrace a rather thin sandy beach of reddish colour, together with some of the rocks uninterruptedly washed by floods. It is the principal port of Panaria, where the small ships can moor quiet safely. Near to the terrace of Sutta u Castieddu house there is a tank of drinking water. Next to this house, they do not grow pergolas, like near the other houses next to the sea; that is why they must remedy with cannas. From Castieddu the path leads to Cuntrata du Castieddu, which made of fertile soil, and fully covered with low pergolas producing black grapes. On the right, a path bordered by superb olive trees, Indian figs, and caper bushes, leads to Drauttu. Alicudi. 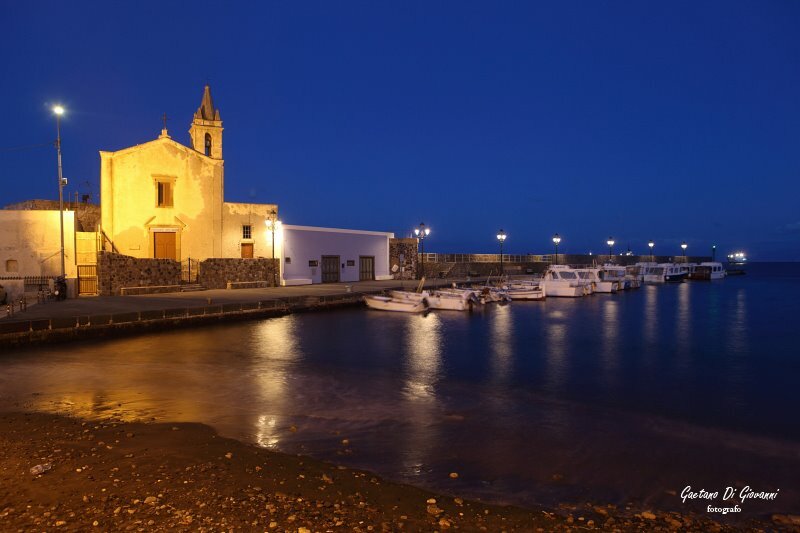 The Saint Bartolomeo Church is situated on the center of the island, almost at half height, in a superb position from which you can admire a wide view upon the sea. On the left side of the church the bell tower rises; and at the front there is a flat slope which dominates the underlying cliffs of Sciara. Close to it you can see terracing and isolated white houses, while on the opposite side there is an amazing view upon the abrupt heights of Muntagna. Looking down you can admire the Bazzina beach, towards which the terracing of Vaddi and Sgorbiu. At the right from the church there is the tank’s mouth full of fresh and precious water. He oil in front of the church is cultivated with eggplants, Spanish pepper, pumpkins, and tomatoes, between which also two date palm trees grow. Lower, in a cottage situated nearby, shadowed by an arbour, supported by two whitewashed Pulera, rom where u can admire a wonderful view at the sea; it is frequent to entertain carabinieri, or other occasional visitors. A path leads to the cottage till Punta in Bazzina. Between the church and the houses of Cuntrada and Sgurbiu, which rise in front of it, there are charming and luxurious arbours (Preuli). Here also grow some olive trees, wild sorbs, and chestnuts, the letter of which could constitute a real richness of the island. 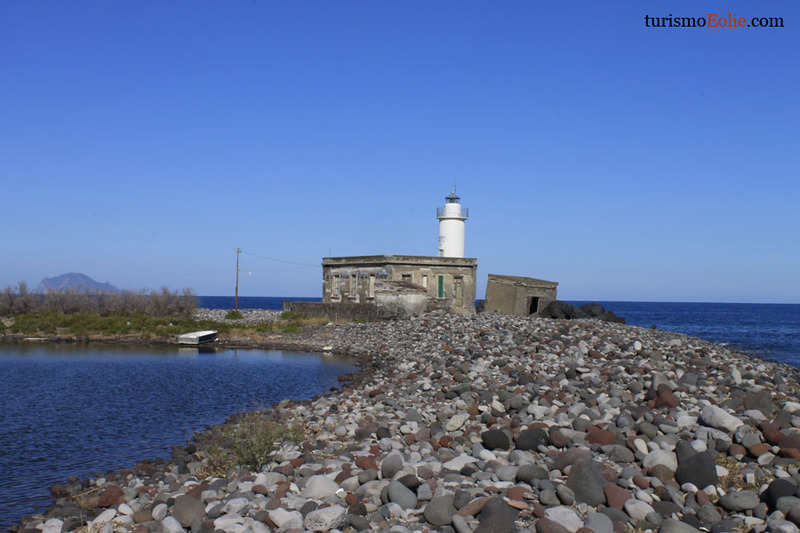 Alicuri is, after Panaria, the smallest of the Aeolian islands. Upon its circular base there is a unique cone. The island is rather barren, similarly to Filicuri, together with whom it forms, as it were, a stand-alone distinct group, according to characteristics, from other Lipari Islands. Filicuri. The most safe moor of Filicuri is that of Picurini, protected enough from the northern winds. Along the stony beach boats pulled out the water are situated, vats, and other tools used by the fishers of Milazzo who frequently visit the island. You can also notice various fish traps belonging to the islanders. Picurini is a humble agglomerate of houses, in one of which a cooper works. Two farmhouses situated a little higher show magnificent arbours of Livedda, very “full-bodied” black grapes. A path, not at least narrow, leads from Picurini towards the church. Once passed the Vadduni and Picurini with its grey lava cliffs turned towards Muntagna and rocks covered with Indian figs on both sides, it climbs between rocky boulders.